This is another stand I own: a 1950's-1960's (?) 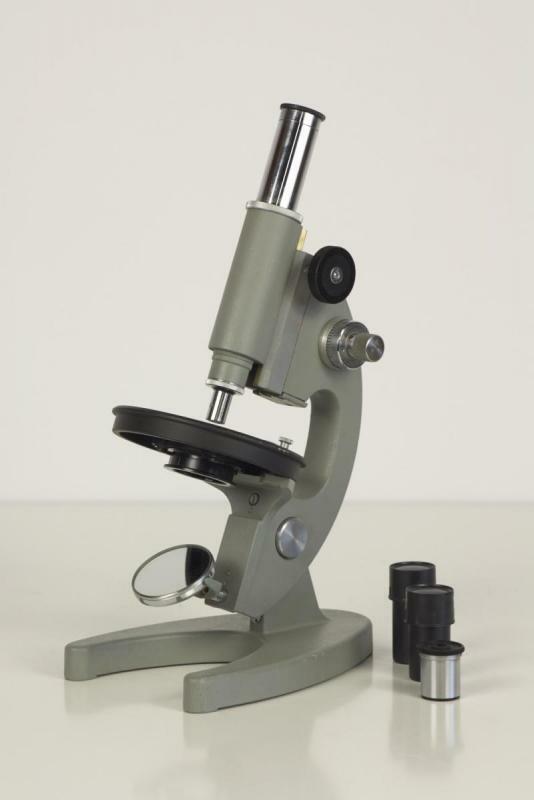 microscope, made by Hensoldt in Germany. As you can see in the picture, it has the "large illumination device" designed by Ernst Abbé and an extendable optical tube. After all those years of use (and neglect), all mechanics are still working silky smooth. The fine focussing mechanism is peculiar, as it has infinite travel, contrary to all other microscopes of that era. The Hensoldt engineers found an ingenious solution for the problem of the limited travel of the fine focussing mechanism: they used an excentric circular disk, moved by a wormwheel. 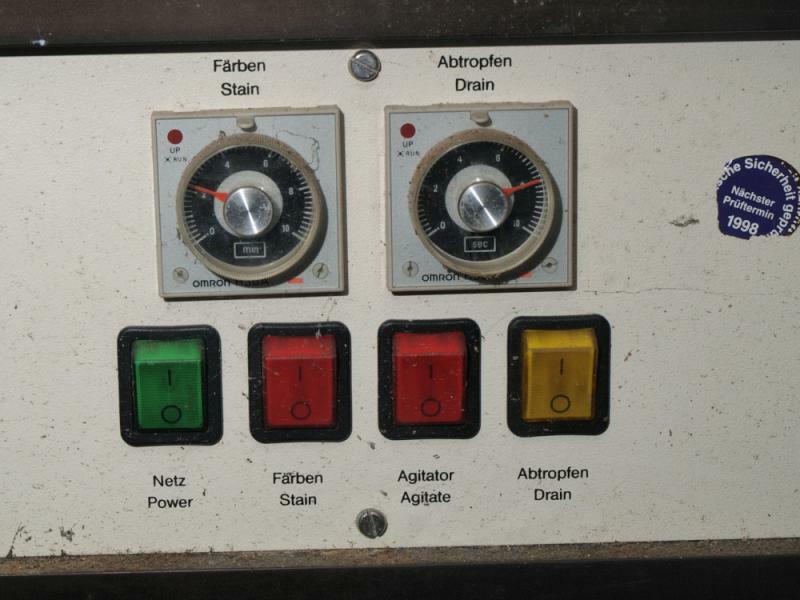 It has one important consequence: depending on the position of the circular disk vis-a-vis the tube, the fine focussing knobs move the tube upwards/downwards. Kind of difficult to explain for me, as I'm not a native English speaker. 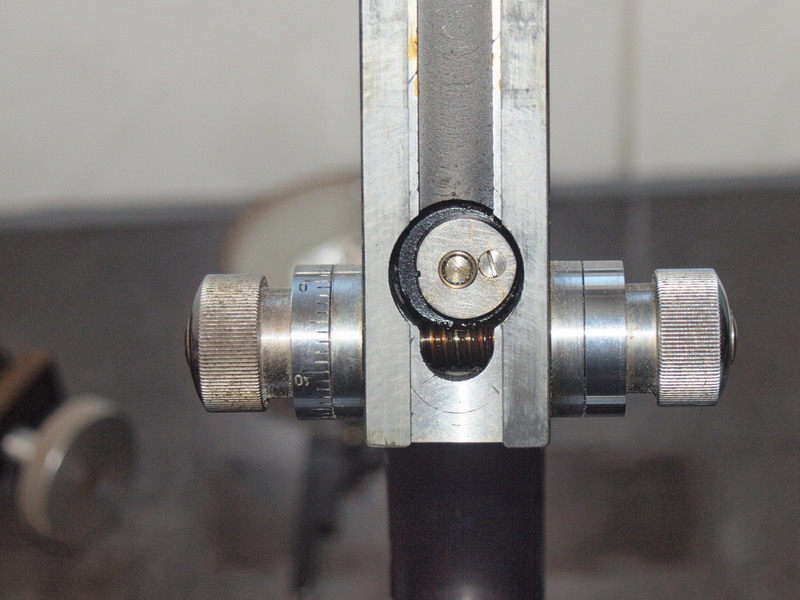 But anyway: a simple, yet elegant solution for the problem of limited fine focussing travel in microscopes. As Goethe once wrote: "In der Beschränkung zeigt sich erst der Meister". This microscope wasn't cheap. As I really would like to have it, I bid far more than I was used to. I finally bought it for some 200 Euro's, which I consider very expensive. It was equipped with 10, 20, 40, 100 achromats.10 and 20 okay, 40 with a problem (very nice and detailed views but lacking contrast) and 100 unusable due to seeped-in oil. Edited by Microscopy, 06 February 2018 - 05:55 AM. 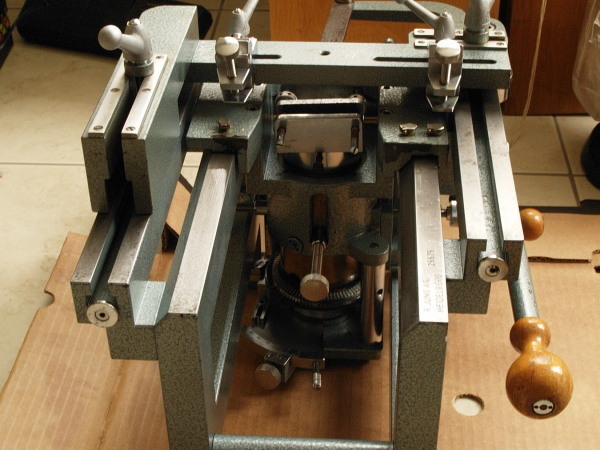 A legendary base sledge microtome: the Jung Tetrander II. I bought this one for pocket money and renovated it. It's vintage 1920-something and it still works as new. Edited by Microscopy, 06 February 2018 - 06:04 AM. 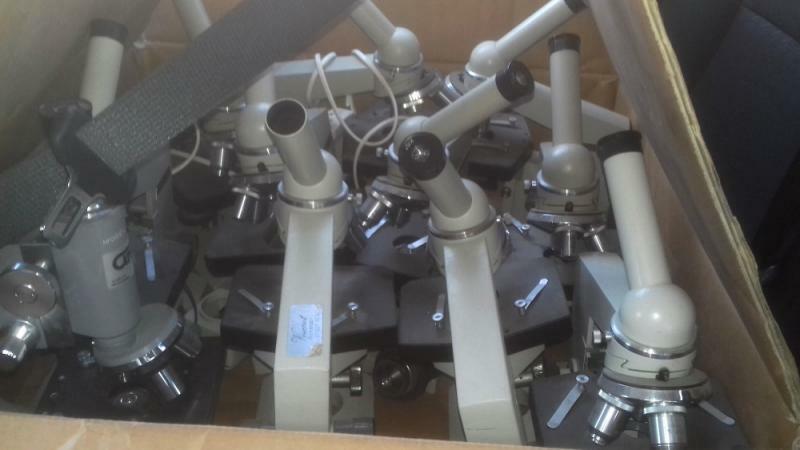 Some of the microscopes I buy to give as birthday present for science interested kids. 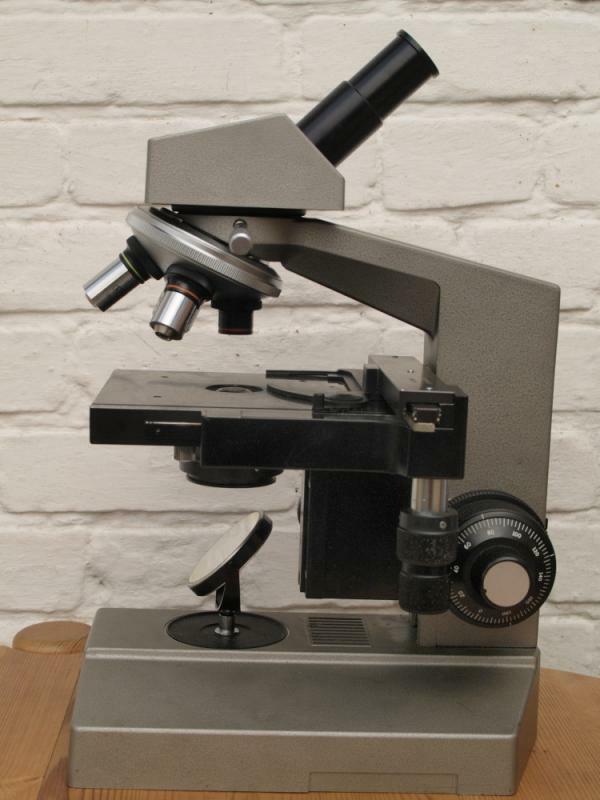 Maybe 35 years ago, I picked up the little drum microscope below at a farm auction. I was standing far off looking at some other stuff, and I heard the auctioneer having trouble getting a starting bid. He was holding up something shiny and brass, so I raised my hand. After making my way over to the table, I asked what I just bought for seven dollars. I know nothing about it, the only marking is "made in france." The only time I ever used it was about 30 years ago to show my then young daughter that salt looked like little blocks. The other one is a Bausch and Lomb job with a 1915 patent date, although it could have been made much later. I figure it's a student microscope. I paid a little under 40 bucks for it at a flea market. The only time I ever used it was to prove to my wife that the white patches on our lawn were some kind of fungus. It works well though. 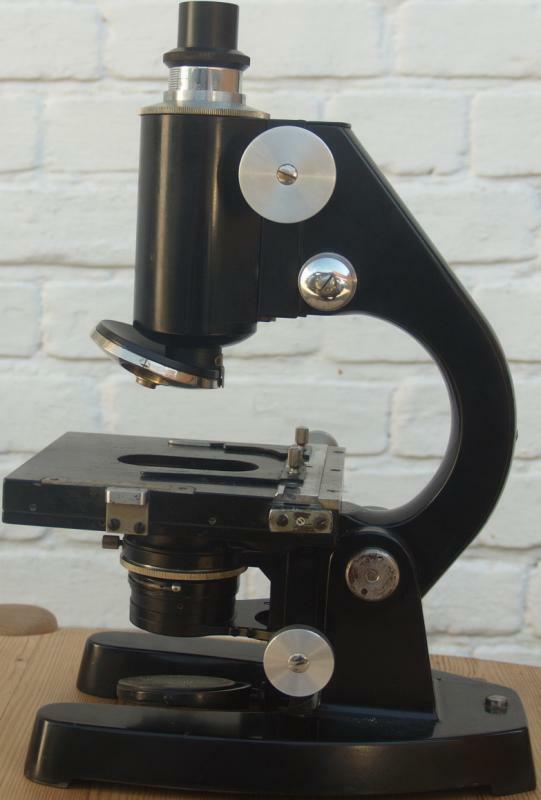 I just purchased this vintage Nikon SMZ-2 model zoom stereo microscope, which is in great condition. With the uncooperative observing weather, I thought an indoor optical hobby might be a good option for the nights where being out with a telescope would be unrewarding. I'm looking forward to adventuring into the micro world, the last time I looked through a microscope was back in 1971 during a high school science class. Edited by Mike E., 23 April 2018 - 01:47 PM. Surprised to find this forum on Cloudynights. 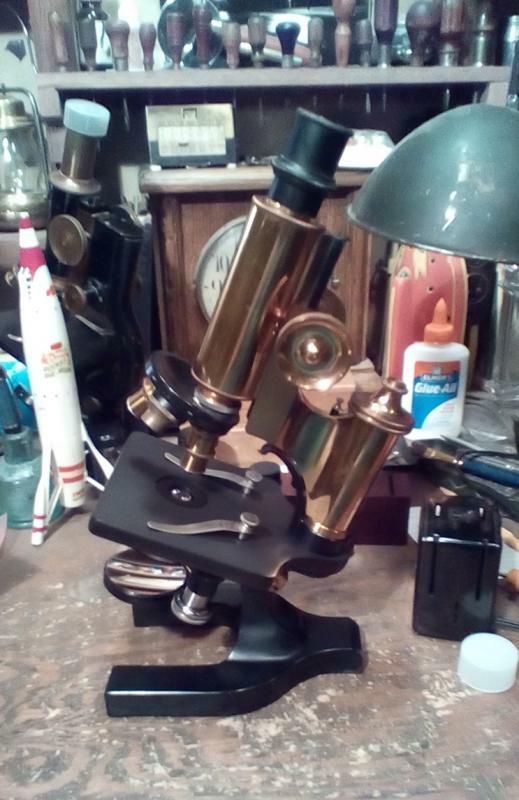 I've restored and collected microscopes for years and have probably a couple of dozen finished models on the shelves. I've got several of the "black beauties" by American Optical/Spencer; a couple of them were new-old stock, meaning that they were in their original new sales configuration and never used! 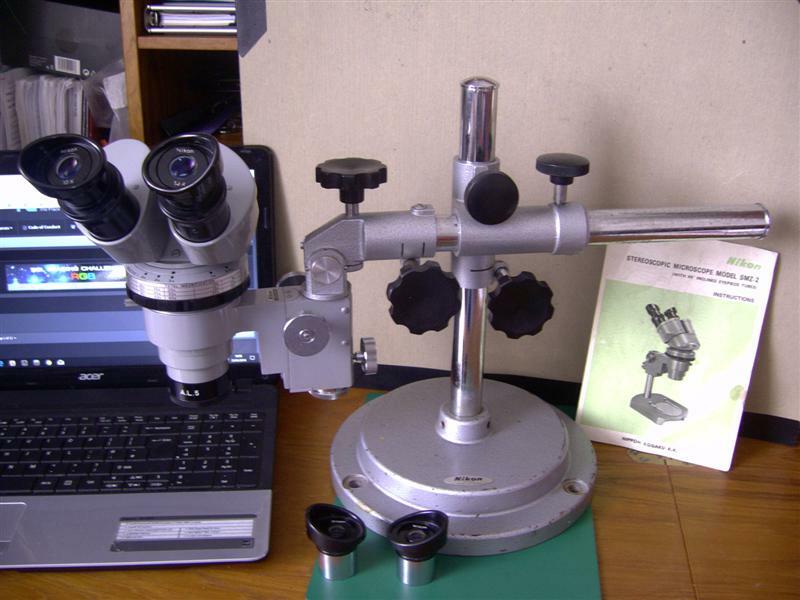 Professional microscopes cost professional prices, until the digital revolution. Suddenly (like cameras) there were oodles of optical microscopes on the used market for bargain prices. 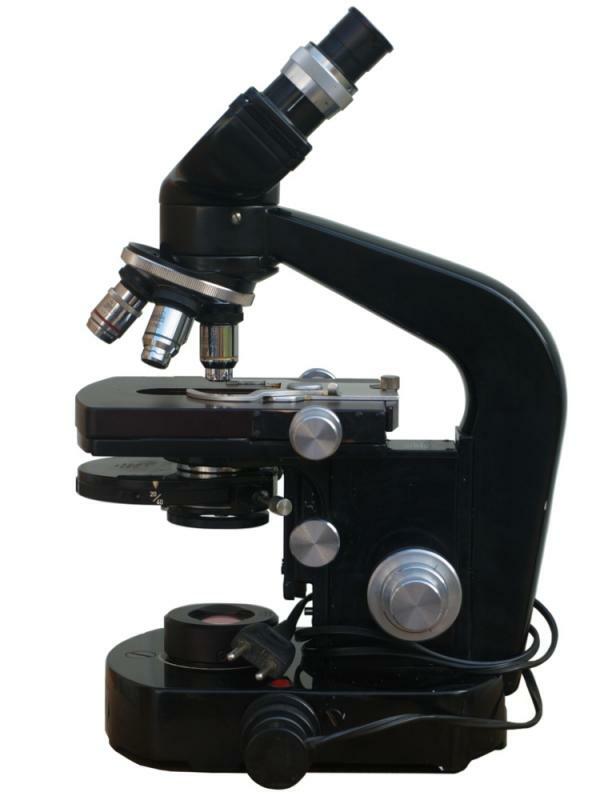 eBay is known for premium prices when there is competitive bidding, but there are far more optical microscopes for sale than their are buyers. 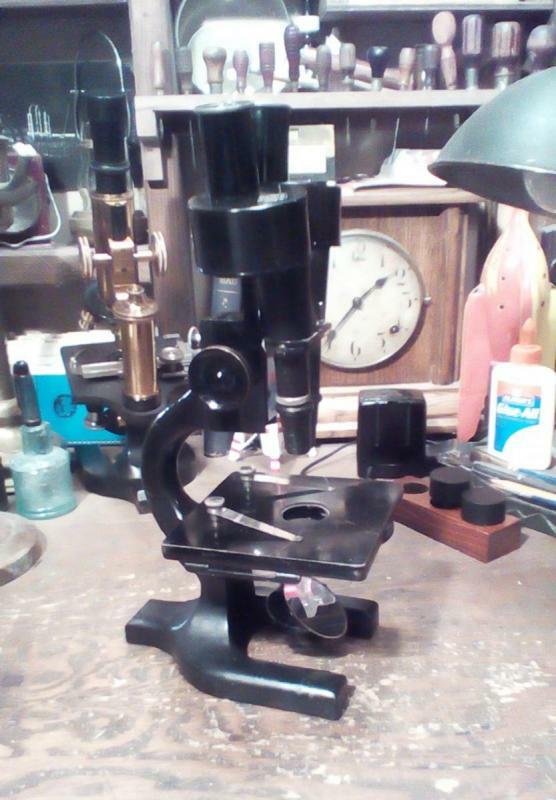 One "new" microscope (AO black) I got for $29. 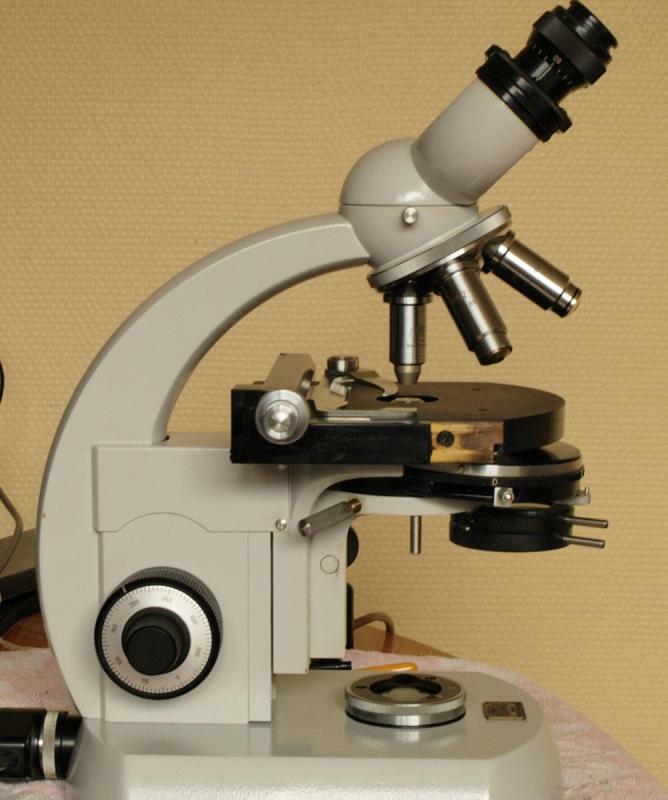 It was unsold stock from a microscope dealer which went out of business in 1949. Still had the label on it! 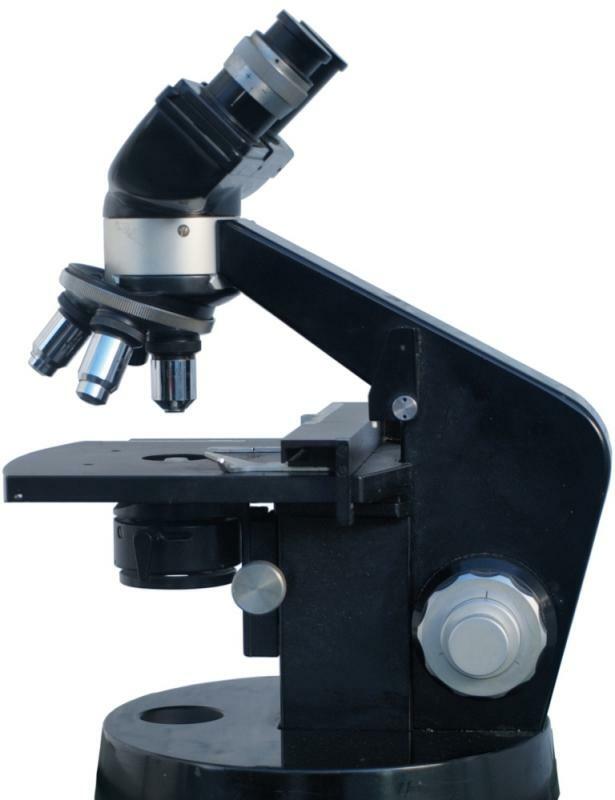 Today, you can buy a used, working, lab-grade microscope for about the same price (or less) than a kid's new plastic kit. Nice micros, by the way. Edited by mnpd, 28 April 2018 - 06:44 PM. Although it will always be astronomy "that matters" for me, I've been enjoying a recent resurgence of my old interest in microscopy. I recently read Slack's 1861 "Marvels of Pond Life," (a delightfully written book that reminded me enough of Thoreau's "Walden," that I re-read that, too,) and I've been bringing home jars of water from surrounding lakes and ponds and becoming reacquainted with the various protozoa, rotifers, etc. 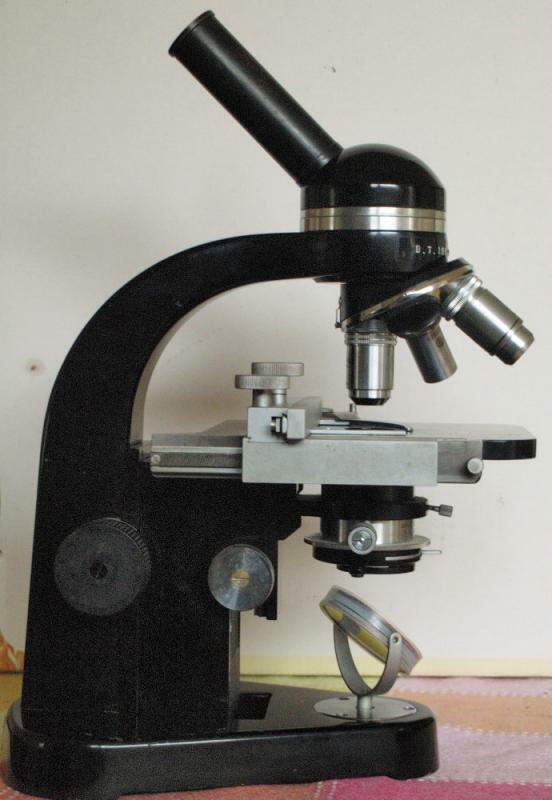 I got to feeling nostalgic about my old microscope I mentioned in post #31, and got tired of screwing and unscrewing objectives into the Bausch & Lomb student microscope shown above. In a fit of enthusiasm and weakness, I found an old Spencer similar to my old long lost 1898 Bausch & Lomb on eBay, and made an offer. This is more like 1910, with a 1906 patent, but close enough. It arrived the other day, and I was relieved to find all it needed was a good cleaning, a bit of lubrication, and a bit of Kroil and controlled violence to free up the frozen knob on the condenser. I also had to open the objectives to get them clean inside, but this went well. I'm not quite done yet, but it's looking good and performing well. The stubby LOW power objective I've got on it doesn't look too classy, but it makes a good "finder scope" for picking a target out of a teaming well slide. Having a good time with my gorgeous new Spencer. Not mine , but i did some work on them . This is another one i got to work on . Great: a Zenit MBU-4. I had one of those as well, at the time. I upgraded mine with a 3 fold nosepiece from Euromex and a condensor holder assembly including the abbe condenser from a Biolam, a spare part bought cheap from EWA-TOE in Brussels. I had to drill two holes in the stand in which I tapped an M3 screw tread to attach it. Allining and centering the condenser assembly turned out to be easy, using some regular houshold aluminum foil and the centering collar of the condenser holder. 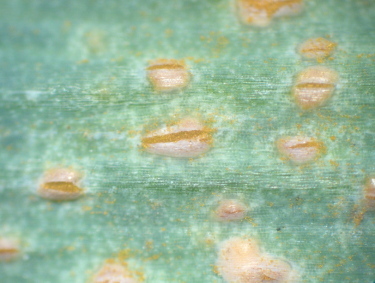 Left: damage on pea seeds, caused by insects, right: leek rust. Edited by Microscopy, 20 September 2018 - 11:24 AM. 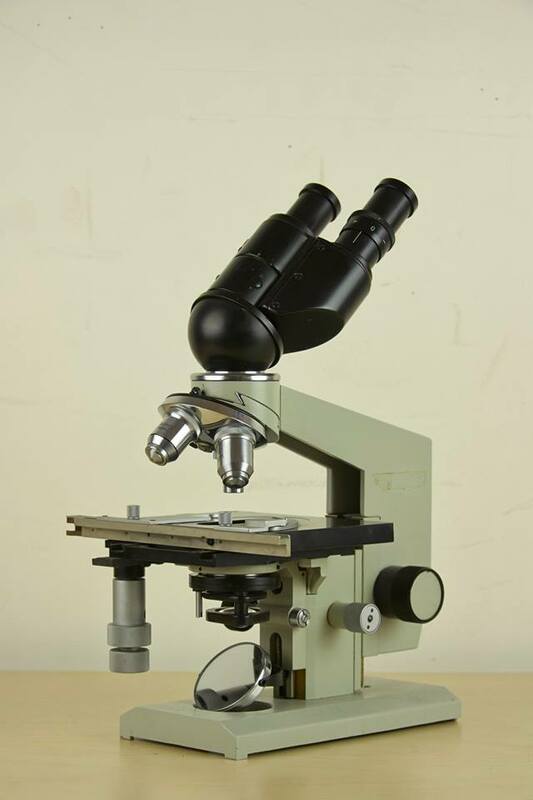 The Wild m20 is sead to be one of the very best microscopes in his category ever made. This one has 20, 40, 50 (oil) and 100 (oil, iris) Wild Fluotar phase objectives and a pair of Wild 10x wide field eyepieces. It's in very good condition, given it's age. Most controls work silky smooth. I wasn't able to test it yet as it's missing the bulb, but the optics used on another stand show impressive images. 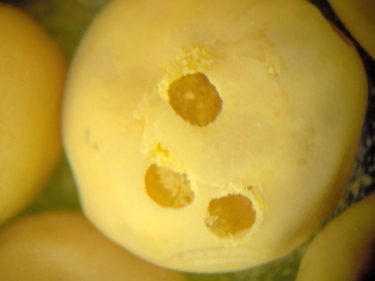 Edited by Microscopy, 17 October 2018 - 08:48 AM. 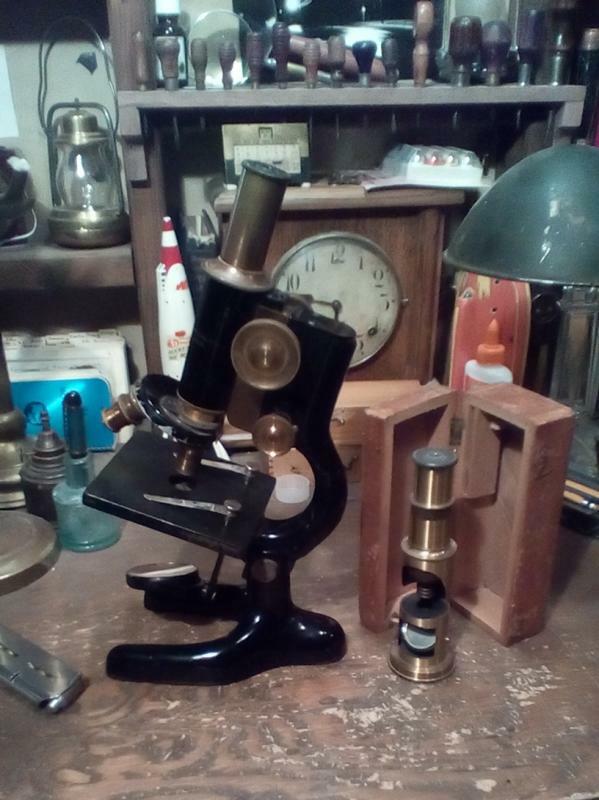 A couple weeks ago, I snagged this old Spencer binocular microscope off eBay. Nobody else seemed to want it for 50 bucks, so I made an offer, and it was mine. As I waited for the UPS man, I researched it as much as I could online... 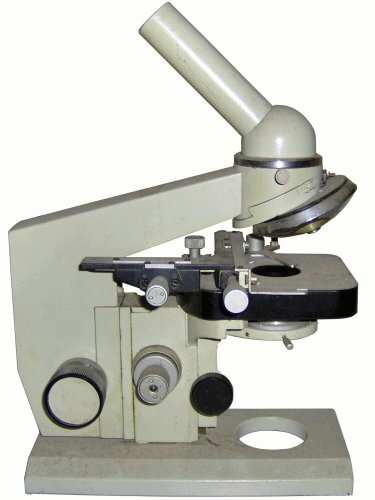 The serial number put it at about 1923, and it showed up in a 1924 Spencer catalog available free as a pdf, which labeled it as a "Spencer Binocular Microscope No. 54. I couldn't find an instruction manual, but that catalog gave a very detailed description that was just about as good. According to the catalog, it's 32 mm objectives along with 10x oculars would give a magnification of 46x. As I followed the tracking number, I also worried a bit about condition and alignment. This thing had two separate optical trains that had to collimate through porro prisms, it was 95 years old, and it had been on 6 different trucks in 5 days. When it arrived, though, things looked good. 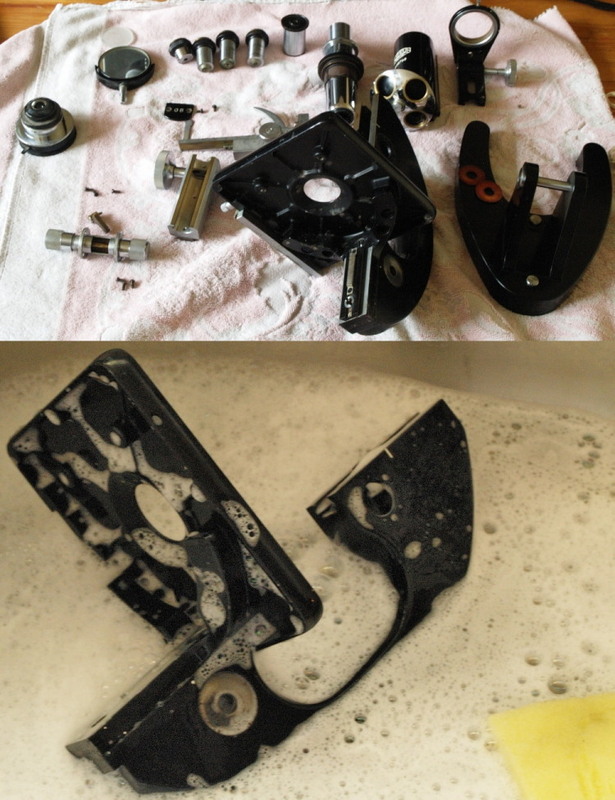 It cleaned up well, and even the optics weren't too dirty. It isn't as pretty as the older brass Spencer behind it, but it has a sort of "steampunk" look that appeals to me. This thing obviously isn't a replacement for the more versatile monocular microscope behind it, but it puts on a whole different show. Very enjoyable watching deep 3 dimensional views of planaria waving through the field and hydra slowly swinging about, doing what hydras do. The most memorable view so far? The 3D dark field view of some boxy, loricated, rotifer with 4 "tails" barrelrolling along among the usual paramecium. (parameciums?) Anyway, I'm happy and it's fun. Only a few weeks after I found that Wild M 20 (see #39), I came across an ad for a Wild M12. The seller was very honest about it: 'I suspect the focusing mechanism to be beyond repair". I bought it. It wasn't very expensive. I'll see what's wrong with it. The illuminator is missing, but I suppose it can't be that much of a problem to adapt a small Zeiss illuminator 15 to the stand and I have a few of those. The Wild M12 is the "little brother" of the M 20. 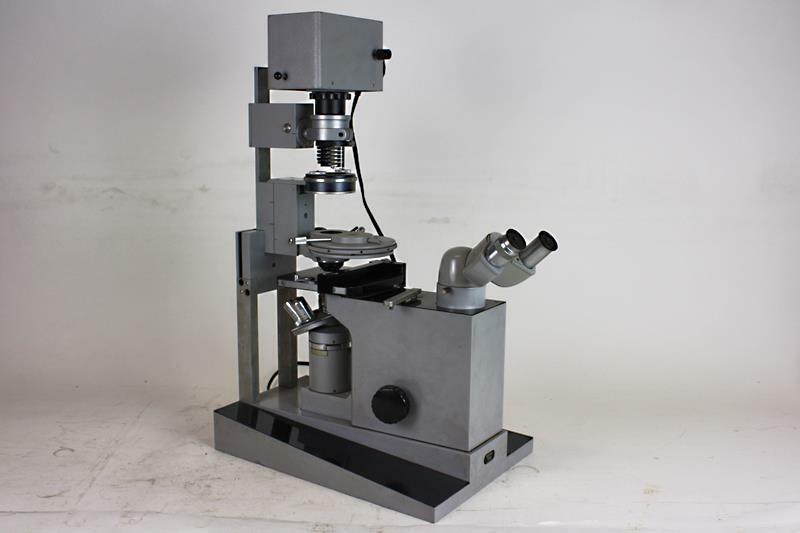 I suppose it was designed as a (routine) (clinical) lab microscope. It's not as heavy as the M20 and the controls aren't that silky smooth, but nevertheless a very decent microscope, I suppose. This one has regular Wild achromats 4/10/40/100, a regular abbé condenser, two 10x eyepieces (Huyghens, I suppose). 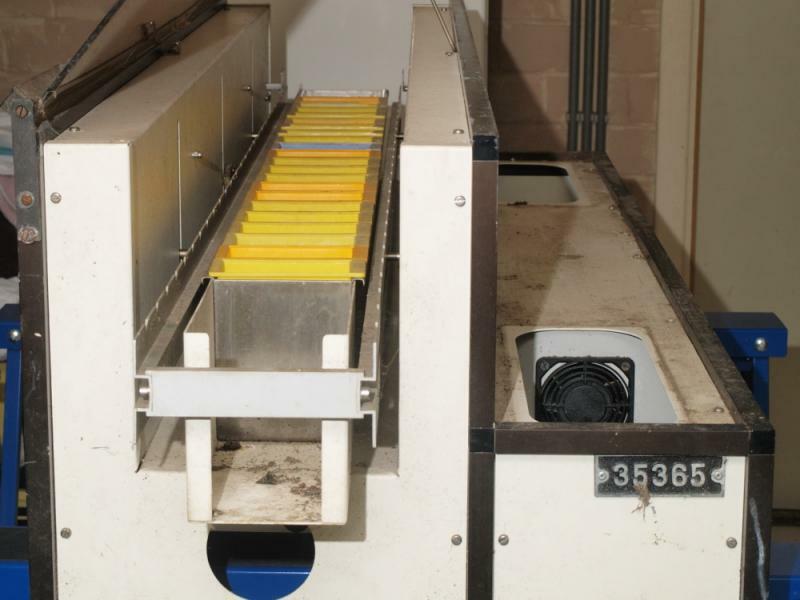 It turned out to be several banana boxes, filled with Biolam microscope stands (see picture) and lots and lots of monocular tubes, some photo tubes, mirrors, illuminators, objectives and eyepieces, condensers, attachable slide holders and so on. I counted 16 stands. Based on a brief view on "that pile of old junk", I estimate that it will be possible to assemble at least some 8 - 10 complete microscopes. I was able to negotiate a very low price, arguing that I wouldn't make any personal profit out of the deal, but instead the microscopes would be overhauled for free and would go to a high school. The seller, who himself has kids in the high school age range, was very forthcoming. The stands/microscopes are a less sophisticated version of the one in Stevies's picture (#35): they're monocular and they lack the large mechanical stage with the coaxial controls. The LOMO Biolam is build like a tank and it's not all that difficult to overhaul. Once the notorious Russian "tank grease" is replaced with propper lubricants, it can be a pretty good microscope from a mechanical POV, unless it's a lemon. Most LOMO optics of that era are copies op pre WW II Zeiss optics. I had a talk with a biology teacher (who is for real: we have biology teachers, who know a microscope only from an image in a textbook as well). 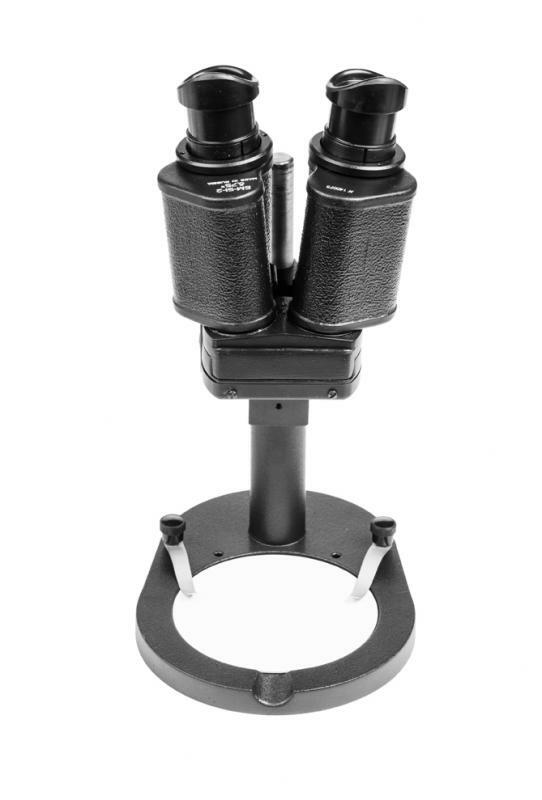 We pretty much agreed on the fact that the Biolam in it's (more or less) "standard configuration" (objectives achromat 8/0.20, 20/0.40, 40/0.65, 90/1.25, eyepieces 7H, 10H, 15C, abbé-condenser 1.25) would be more than sufficient to meet every criterium in the biology curriculum. [OT]: any suggestions to make the objectives "theft proof"? I was thinking -as a first idea- of drilling small holes through the side of the nosepiece and the objective's thread, cutting thread and secure the objectives with thiny headless bolts with M1.4 - M2 thread (like this one: https://eshop.wurth.....sku/nl/NL/EUR/), but perhaps there are better methods. 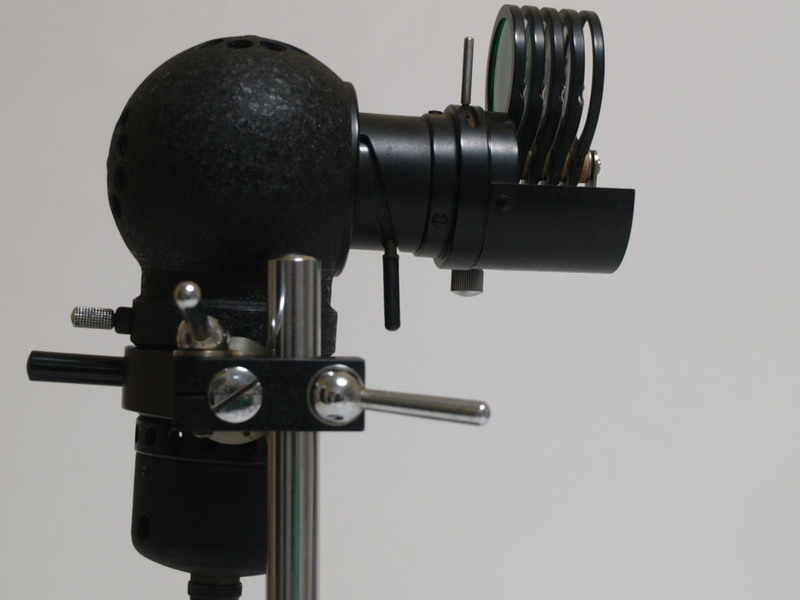 Securing eyepieces is not an option, unfortunatly, as removing the eyepiece is absolutely necessary to achieve correct setup of the illumination system. I collected the last box today. Apart from the Biolams, there's also a nice Euromex LMS (in the picture left bottom corner) and a Meopta microscope. Well, I learned something new, the last couple of days: schools aren't interested in microscopes for free. I contacted a few. Some didn't even bother to answer, other answered they "use more modern methods, such as Powerpoint presentations", LOL. That's the old school spirit!! Replace field skills with search engine skills. The only hands-on anymore is with keyboards. I guess looking through oculars at the unseen collected in a backyard has become passe. My oldest daughter did a summer internship,during highschool, at a local place called The McLaughlin Research Institute. They do research on Alzheimer's which my father has. It was all lab work, harvesting braincells from mice, staining, preparing slides, and counting vacuoles in the tissue samples through some very high grade research microscopes. She quickly learned she preferred field research to lab research. But...she knows how to use a microtome, stain, and prepare slides for research work. Which came in handy during college.